In 1941 Disney released Dumbo. Inspired by a story by Helen Aberson and Harold Pearl that by all accounts was never published in the way it was intended to be back when originally written in 1939 (the historical record isn’t exactly clear), the 64-minute effort was a heartbreakingly beautiful story that has been wowing viewers young and old for over seven decades now. Featuring Academy Award-winning music by Frank Churchill and Oliver Wallace, spellbinding moments of visual splendor that still amaze today and songs, most notably the Oscar-nominated classic “Baby Mine” (it lost to Jerome Kern and Oscar Hammerstein’s “The Last Time I Saw Paris” from Lady Be Good), next to Bambi it’s hard to imagine any other animated effort personally overseen by Walt Disney during the studio’s early years has elicited more tears from so many different people than this one has. It’s a masterpiece, no question, and I cannot imagine what my childhood would have been like had this film not been a treasured part of it. With Disney seemingly eager to remake as many of their animated films as live action (or live action equivalent) offerings as possible, it was only a matter of time before Dumbo got the same treatment as Cinderella, The Jungle Book, Pete’s Dragon and Beauty and the Beast did before it. 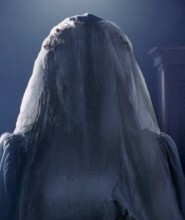 In fact, it is the first of three such updates to be released to theatres before the end of the summer (Guy Ritchie’s Aladdin and Jon Favreau’s The Lion King being the other two), and with a sequel to Maleficent (a 2014 reworking of Sleeping Beauty that made the formerly evil sorceress a misunderstood heroine fighting for redemption) in October and Mulan in 2020, it’s not like the studio has any plans to stop mining their extensive vault of family-friendly classics for potential re-creations anytime soon. The good news? 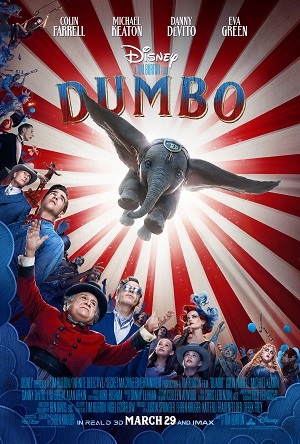 While nowhere near as wondrous as either Cinderella or Pete’s Dragon, and while not as visually eye-popping as The Jungle Book, I still found this new Dumbo to be surprisingly captivating. Directed by idiosyncratic madman Tim Burton and written by Ehren Kruger (The Ring, Ghost in the Shell), this update wears its larger-than-life heart on its sleeve and is singularly composed to enthrall children with its sense of magical wonderment. For the director, likely shocking no one this effort fits more in line with previous offerings like Edward Scissorhands, Frankenweenie or Miss Peregrine’s Home for Peculiar Children than it does his darker efforts like Batman, Sleepy Hollow or Sweeney Todd: The Demon Barber of Fleet Street, the tone and style unabashedly childlike in both in its execution and in its presentation throughout all 112 minutes of the story. Set during WWI, the plot revolves around the return home to the United States of former trick-riding cowboy Holt Farrier (Colin Farrell) after he is wounded in action and loses an arm. Back at the Medici Brothers Circus he is reunited with children Milly (Nico Parker) and Joe (Finley Hobbins), his old boss Max Medici (Danny DeVito) and many of the circus’ key performers taking care of them both after his beloved wife tragically passed while he was away in France fighting the Germans. Hoping to return to riding, Max’s circus has fallen under hard times and has been forced to sell off many of its more valuable assets in order to survive, and that includes Holt’s horses. The only job available is to take care of the elephants, a position made even more vital due to the fact the gigantic Mrs. Jumbo is about to give birth, a baby elephant just what the circus needs in order to increase ticket sales and start building towards hopefully better days. But this little tyke, at first named Jumbo Jr., isn’t what was expected. He’s got big floppy ears and a wide-eyed timidity that make him nothing short of a joke to the paying audience. 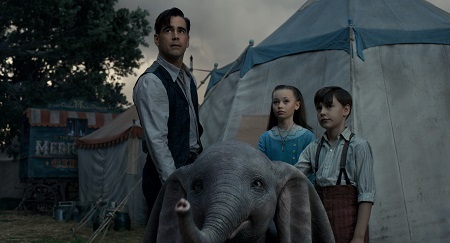 Quickly renamed Dumbo, Max hatches on an idea to turn the baby elephant into a circus clown, thinking that if ticket buyers are going to laugh at the little guy they might as well do so based on his antics and not because of his peculiar abnormalities. At the same time, Milly and Joe refuse to believe the newest member of the Medici Brothers Circus cannot become a star, especially after they discover just what it is he’s capable of. Working together the trio manage the impossible, and by the end of Dumbo’s first performance the whole world suddenly believes an elephant can indeed fly. This new take on the timeless story involves far more people in its storytelling than its animated predecessor did. Sometimes this works beautifully, most notably with the trusting friendship that develops between Milly, Joe and Dumbo. Other aspects unfortunately do not, and that’s oddly the overarching tale of a grieving Holt overcoming his regret and despair at the loss of his wife, arm and job in order to realize just how gigantic the wonders of fatherhood can still be as long as he is willing to notice their existence. Also, Dumbo learning to fly, his showing an amazed audience that he could do so and reuniting with his imprisoned mother Mrs. Jumbo in the process, that was the entire plot of the original. Here, that’s barely the first hour of the film (if that), the entire second half devoted to a tale of a greedy Coney Island amusement park impresario trying to add the elephant to his stable of fantabulous attractions. Thing is, as extraneous as that addition the plot might be, I still liked it quite a bit. Michael Keaton is delightfully smarmy as the duplicitous V. A. Vandevere, while Eva Green lights up the screen as heavenly aerial daredevil Colette Marchant, a circus performer given the task to ride Dumbo as he soars above an awestruck audience. Burton’s knack for crafting wild, discombobulating visuals is as sharp as ever, Rick Heinrichs’ (Sleepy Hollow) colorfully eccentric production design and Colleen Atwood’s (Chicago) magnificent costumes nothing short of stunning. Throw in Danny Elfman’s (Batman, Milk) marvelous score, which inventively reworks themes and songs from the 1941 feature with eloquent effortlessness, and my inner eight-year-old almost could help but come out to play. I enjoyed myself immensely, and to say I was happily smiling start to finish wouldn’t be stretching the truth by all that large a margin. I do wish with the movie spent more time focusing on its titular character. 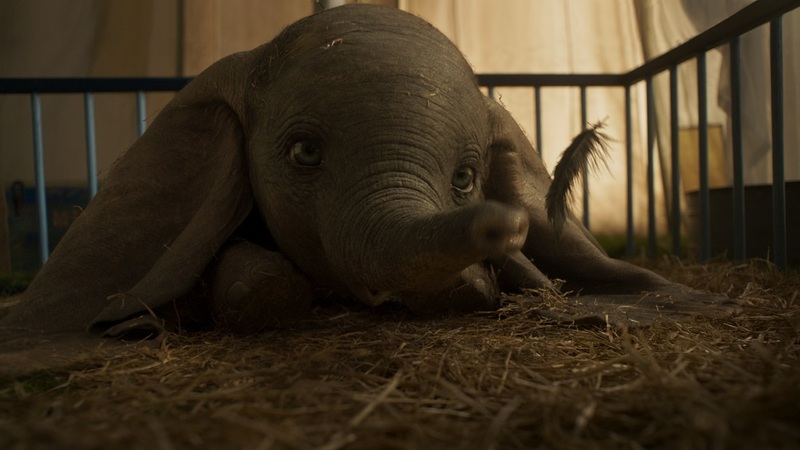 Dumbo is magnificently created, the visual effects wizards behind his birth deserving of an enormous amount of praise. His expressive eyes fill the screen, and every time the little guy took flight my heart soared so high it almost crashed through the theatre’s ceiling. As this is his story he deserves to be the focal point of it, and yet for long stretches of the narrative he’s frustratingly more of an afterthought than he is an integral central figure. That this isn’t a fatal flaw is a testament to just how beguiling all of the moments involving the baby elephant prove to be, and while this is a problem, I just can’t find the energy or the desire make it a big one. It’s hard for me to state that Burton’s Dumbo will ever mean as much to me as the 1941 feature did. There’s just no way that could happen. Just as clearly, I also can’t imagine the film will inspire and move countless generations of viewers in anything approaching a similar manner. But that doesn’t mean Burton has dropped the ball. His version of the story has spirit and it has imagination. It delivers visual wonders that are exuberantly spellbinding. Most importantly, it has a heart so overflowing in the hope for a better world and in the promise of future generations changing society for the better that cannot be denied. I believed an elephant could fly, this Disney remake a beguiling fantasy that does its animated predecessor proud.